REDWOOD CITY, Calif.--April 28, 1997--The 3DO Company and Samsung Electronics Co., Ltd. announced today the execution of a definitive agreement under which Samsung will purchase 3DO's hardware systems business for $20 million in cash. The transaction, which will close as soon as Korean and U.S. government approvals are obtained, gives 3DO significantly increased capitalization and completes 3DO's transformation into a video game software company under the leadership of Trip Hawkins, founder, an industry innovator who also founded Electronic Arts, the world's largest entertainment software company. Samsung will form a new company based in Silicon Valley focusing on multimedia systems and semiconductor products. Approximately 75 3DO employees, currently in 3DO's hardware systems business, will be offered positions in the new organization. Tobin E. Farrand, currently Senior Vice President of Engineering, 3DO, will become President and Chief Executive officer of the new Samsung subsidiary. "This deal allows 3DO to continue our momentum, be more focused and provides us with the capital to be a major player in the video game software business," said Hawkins. "As a world-class manufacturer, Samsung has the skills to capitalize on the potential of our hardware designs. While we initially pursued a joint venture structure with Samsung, we both eventually agreed that a sales transaction was in fact better for both companies, because we could each be more focused on our core competencies." Hawkins also announced key management changes at 3DO in conjunction with the transfer of the hardware operation to Samsung. Trip Hawkins will reassume complete operating control of the new software-focused 3DO as Chairman, Chief Executive Officer and President. As was planned, Hugh Martin, who has served as President and COO, will oversee the orderly transition of the business to Samsung and phase out of his day-to-day duties. He will remain an active member of the board of directors. Martin, who has an engineering and operations management background, was responsible for the design and introduction of 3DO's hardware systems. He negotiated the licensing of 3DO's M2 technology to Matsushita 18 months ago and the sale of the hardware group to Samsung. Steve Fowler has been promoted to Senior Vice President of Operations. Terrence Schmid has been promoted to Vice President of Finance and Chief Financial Officer. And Cathryn Singer, formerly Vice President of Sales for New World Computing, has been appointed Vice President of Sales for 3DO. The original $100 million license agreement with Matsushita and the new $20 million deal with Samsung puts 3DO on a strong footing in the video game business. "We are well-known for our troubles on our first-generation hardware system," said Hawkins. "But we followed that with a significant profit from our second-generation M2 system, and now we've made another major transaction that is highly profitable. While we learned our lessons, and made two deals that gave us significant profits, we have realized that the hardware business is for large companies like Samsung and Matsushita. Personally I am pleased to be focused again on making great game software, and I am delighted to rejoin that industry with solid products in the pipeline, a strong balance sheet, great teammates and no distractions." 3DO's software business has been gaining momentum. The company recently signed a licensing agreement to publish titles for the Sony PlayStation. In recent weeks, 3DO's first hit game for the PC, Heroes of Might and Magic II, has closed in on 200,000 units. The title has won several game of the year awards including PC Gamer's rating as "the 6th best PC game ever made." A Macintosh version was released in April, and in May, 3DO will release an expansion kit product called Heroes of Might and Magic II: The Price of Loyalty. The game magazines are also buzzing favorably about 3DO's three major fall releases for the PC, Uprising, Might and Magic VI, and Army Men. "The Might and Magic series has sold 3,500,000 units in its lifetime and its next release should be a major event for us," Hawkins said. "We also expect to have our first Sony titles in early 1998." Revenue and accolades also continue to grow for 3DO's debut Internet game, Meridian 59, which has won two game of the year awards and was recently enhanced with a major new upgrade, Meridian 59: Vale of Sorrow. Under the terms of the Samsung deal, certain physical assets of 3DO's hardware systems business will be sold, ownership of certain intangible assists will be assigned, and licenses and sub-licenses covering certain intellectual property rights will be granted to Samsung. Samsung will assume any liabilities for Korean government taxes relating to the transaction and 3DO will receive a net cash payment of $20 million. The new Samsung subsidiary will assist 3DO as a subcontractor regarding the completion of the remaining contract deliverables due under 3DO's M2 technology license with Matsushita Electric Industrial Co., Ltd. 3DO, however, will retain all its rights to receive software royalty revenue from the M2 deal with Matsushita. "I'm delighted to have had the opportunity to work with Trip and to help the company complete this transition so I could leave on a winning note," said Hugh Martin. "I joined 3DO to build the systems business, and this deal brings that activity to a profitable conclusion." "I'm pleased to have Hugh continue as a member of the board of directors, but he is very talented and it is time for him to have a company of his own to run," Hawkins said. 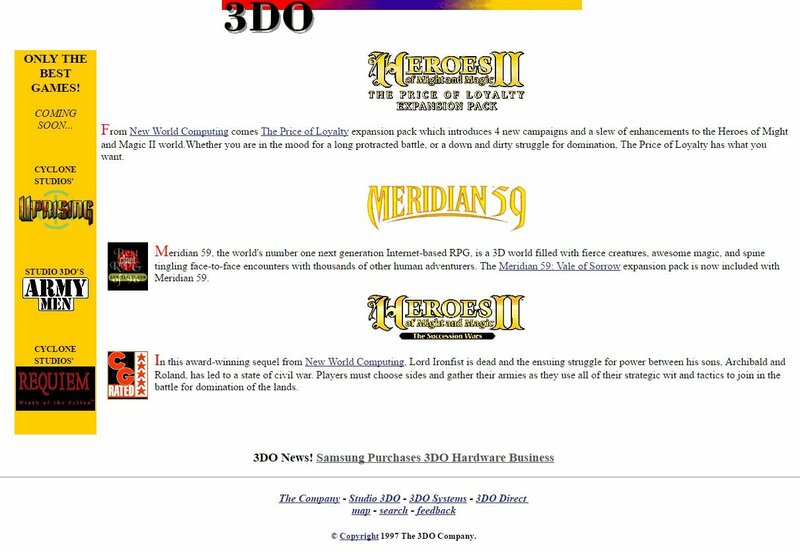 3DO, the 3DO logos, Heroes of Might & Magic II: The Succession Wars, Meridian 59, Army Men, and Uprising are trademarks and/or registered trademarks of The 3DO Company. All other product names are trademarks and/or registered trademarks of their respective owners. REDWOOD City, California. - 28 апреля 1997 - 3DO Company and Samsung Electronics Co., Ltd. объявила сегодня о выполнении окончательного соглашения, согласно которому Самсунг купит бизнес аппаратных систем (приставок) 3DO за 20 миллионов долларов наличными. Сделка, которая завершится, как только будет одобрена корейским и американским правительством, дает 3DO значительно увеличенную капитализацию, закончит преобразование 3DO в компанию - разработчика программного обеспечения для видеоигр под руководством Trip Hawkins’a, основателя, инноватора индустрии, который также основал Electronic Arts, самую большую в мире компанию - разработчика игр. Самсунг сформирует новую компанию, базируемую в Силиконовой Долине, сосредотачивающейся на мультимедийных системах и полупроводниковых продуктах. Приблизительно 75-ти служащим 3DO, занятым в настоящее время в бизнесе приставок 3DO, предложат должности в новой организации. Tobin E. Farrand, в настоящее время старший вице-президент, 3DO, станет президентом и генеральным директором нового филиала Самсунга. "Эта сделка позволяет 3DO продолжать наше дело, быть более сосредотаченными и предоставляет нам средства, чтобы быть главным игроком в бизнесе программного обеспечения видеоигр," сказал Hawkins. "Как у изготовителя мирового класса, у Самсунга есть возможности, чтобы вырасти на потенциале наших аппаратных наработок. В то же время мы изначально ставили цель совместного предприятия с Самсунгом, обе организации в конечном счете согласились, что коммерческая сделка будет лучшим решением для обеих компаний, потому что каждая компания сможет больше сосредоточиться на своих ключевых задачах (возможностях)." Hawkins также объявил о ключевых кадровых изменениях в 3DO, наряду с передачей аппаратных средств Самсунгу. Trip Hawkins вновь возьмет на себя обязанности председателя, главного исполнительного директора и президента программных разработок 3DO. Как и планировалось, Hugh Martin, который занимал должность президента и главного исполнительного директора, будет наблюдать за последовательным переходом бизнеса к Самсунгу и постепенно прекращать свои ежедневных обязанности. Он останется действующим членом совета директоров. дальше перечисление кто и какие посты занял. Хокинс говорит о том, что у них были проблемы с их первым поколением приставок и они их учтут в М2. Бла-бла-бла. . Далее об объёмах продаж Heroes of M&M и других их игр. О желании выпустить в 1998 году игры на платформе от Sony.